Going Greener | That Was an Accident! The original plan was to dump Ignitine on the Isle of Thunder until she located a free copy of that dark literary classic, “Sealed Tome of the Lost Legion.” It’s no Basketweaving the Sinister Way or anything, but all the reviews on Amazoneroth are positive – and it’s needed to start the green fire questline. This is how exciting the “farm it yourself” plan is. Ignitine: This plan is boring, and I don’t like waiting for RNG. Prinnie: It’s true, RNG is still a mean son of a gun. Fortunately, few people spend their free time on the Isle these days, which means there’s more stuff for you to kill! Ignitine: Not true. There’s a whole cast of people who farm the joint specifically for that stupid book. Ignitine: Yep. Given that you’re competing for rares and will end up spending a good amount of time looking for a copy anyway, isn’t it much more efficient to spend the same amount of time accumulating the gold needed to simply buy it? Less overall exposure to the Isle of Thunder. Prinnie: … but that’s not … I guess you could, but you’re supposed to do it yourself! It’s better that way, you know, it shows that you care. That you’re legit. Ignitine: Screw that, since it’s not like you get an autographed copy or anything. Prinnie: Holy @#%&! The tome is … it’s … it’s like … 30k! Ignitine: That was yesterday, the market fluctuates some. Also, need I remind you that you hate the Isle of Thunder because it’s dark, damp and depressing? Also dank, if we’re going for descriptions starting with the letter “d” …? Disgusting, perhaps? Prinnie: …………………………. shut up. You do have a point, but shut up. After deciding to fork over 19k of my precious hard-earned gold (NO I’M NOT BROKE WHY DO YOU ASK) for a slightly used copy of the tome, Ignitine promptly put it to use by shoving a soulstone into the cover as hard as she could. It then morphed into the latest sequel in the Warlockian Wars series, the “Code of Xerrath.” Sadly, she apparently picked up a copy in a language she could not comprehend. As the tongue is in fact quite rare, the authors perhaps foresaw this problem, and the first page helpfully suggested asking her demons for a translation. Ignitine: Wait just a second – I never ask my demons about anything. I don’t see why I should start now. Prinnie: Well, Google ain’t gonna cut it here. Ignitine: I feel like my right to be heedless of all things that support me has somehow been infringed upon. 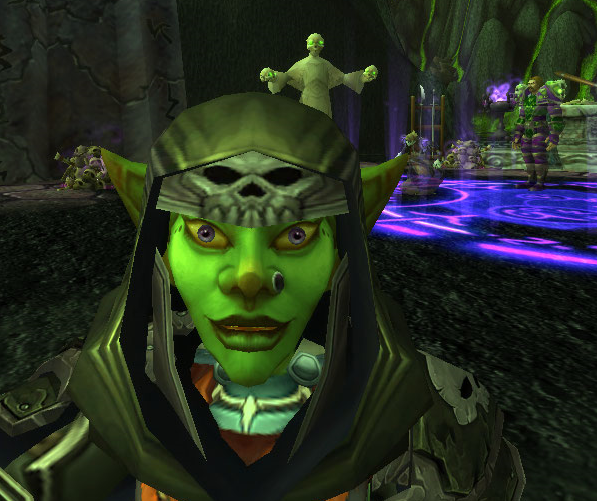 Next, Ignitine was sent to Orgrimmar to talk to the warlock trainers there. The reunion was a bit … awkward. She hadn’t exactly been an obedient student when it came to the ways of mastering all-encompassing dark power. 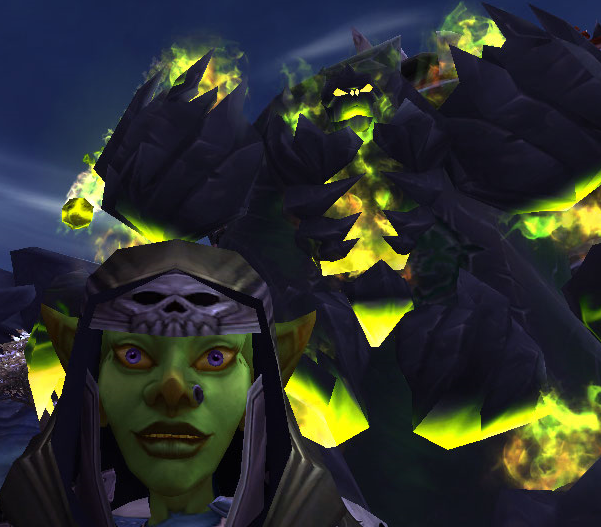 Ignitine only talked to the warlock trainers when she wanted to rename her demons (she had an imp named “Zipnibblebit” or something like that), and she’d been all too glad to skip town on a zepp out to Northrend. So perhaps as a bit of passive-aggressive punishment, they assigned her a lot of reading. By WoW standards, I do mean totally TL;DR.
Prinnie: Except Ignitine did read it all, which kind of concerns me. After that, it was time to use clues contained within Jubeka’s journal to collect the Soulstones and witness memories she left behind. 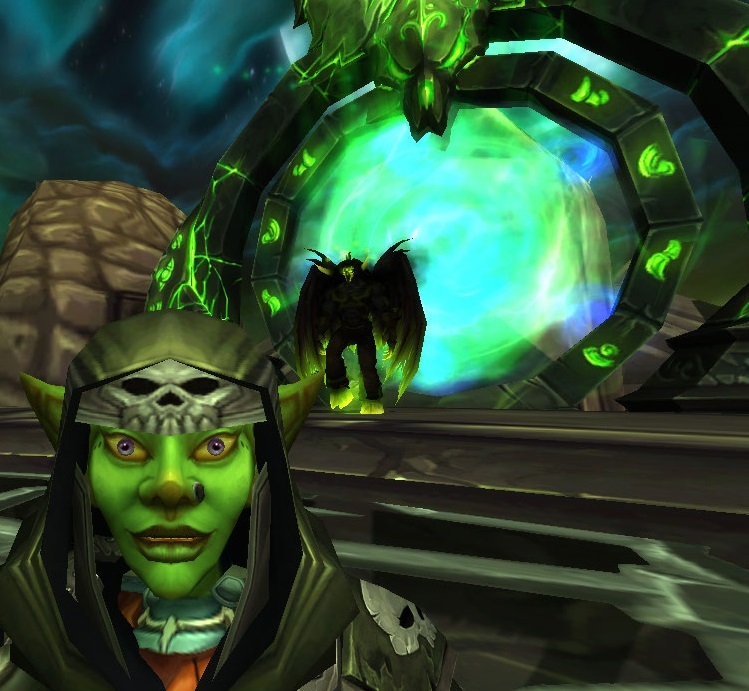 Ignitine mogged herself in green because that’s important, and she headed to Outland. An important plot point is always the best moment for a selfie. Prinnie: /hisses Ignitine, put that SELFIE camera away! This is an important plot point! 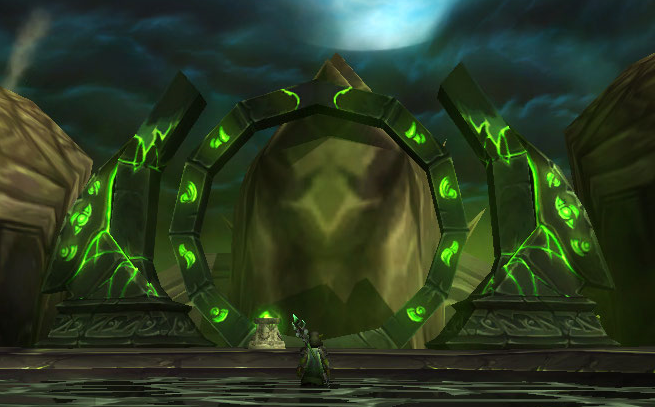 After finding them all, it was finally time for Ignitine to head into the Black Temple. It’s not my fault Blizzard gave the S.E.L.F.I.E. cam into the world. Prinnie: … I swear, Ignitine, you have no dignity. Rather than spoil the whole thing (or repeat all the walkthroughs that already exist), I’ll just point out that trusting a warlock is never a good idea. Ever. Ignitine has famous friends. Sorta. Ignitine: CHECK IT OUT. It’s me and my BFF Kanrethadies! Prinnie: BFF? THERE WAS MURDER. Ignitine: That IS true. I guess he was my BFF. Prinnie: Welp, thanks to Ignitine’s questionable definition of “friend,” I can officially report that if you go in at level 100 with a 646 item level and are not horribly stupid, green fire is now easy. The SELFIE camera is best used at the worst possible moments. I was sort of tempted to use it during the Kanrethad fight itself, but I chickened out. I like the way Ignitine thinks, and I must say she looks marvelous in those selfies. Take that, Kanrethad! I hope she beat the tar out of you! There’s a little bit of goblin in us all, I must say. 😛 And she totally did! At this point, if you’ve got around a 645 gearscore, the most important thing is to use Grimoire of Sacrifice prior to entering the fight. That buffs you up and you can control the big Pit Lord that Kanrethad summons, which in turn enables you to use its Charge to interrupt the bad things Kanrethad casts. At that gearscore, you *can* still die, but only if you’re not paying attention and/or asleep at the keyboard. You’ll probably kill Kanrethad fast enough that you won’t need to use the heals-you-kills-the-pit-lord ability of the Pit Lord (one of your own healthstones should keep you covered). 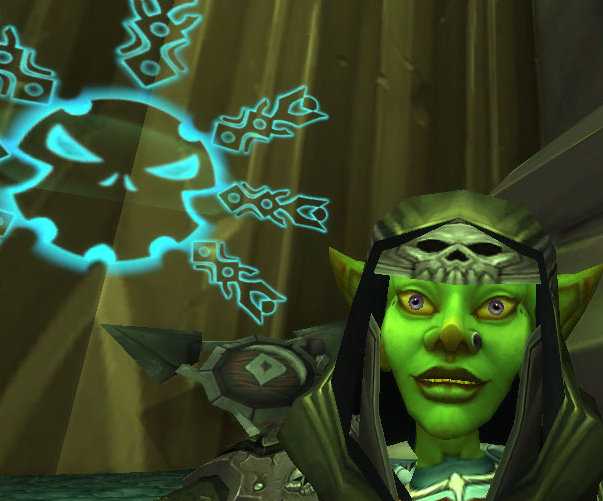 I did use the Charred Remains talent because I like Chaos Bolts, but I am uncertain as to whether or not that actually made a huge difference. Pingback: So Tired. So, So Tired. | That Was an Accident!